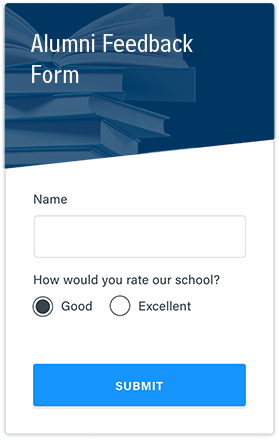 Use our drag & drop form builder to easily create your own online form or survey. 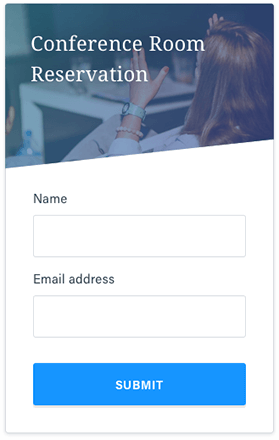 Use our drag & drop form builder to easily create your own online form or survey. 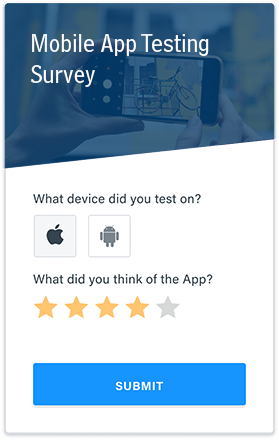 Choose from over 100 customizable templates and 40 question types to create registrations, customer surveys, order forms, lead forms and more. Share a secure link to your form or embed it into a page on your site. We handle hosting your form and processing your results. Share a secure link to your form or embed it into a page on your site. Your forms are automatically responsive for all device types: desktops, tablets, and phones. We handle hosting your form and processing your results. Receive your results in real-time with email notifications. Export your results or integrate them with third party services and payment processors. Securely share stylish reports featuring tables and charts. Receive your results in real-time with email notifications. Export your results or integrate them with third party services and payment processors. Completely customizable using our Look & Feel tools. Start with several pre-made themes, and further customize your forms to match your own branding. A form tailored for you. Process payments on your own, or integrate with a payment service such as PayPal, Braintree, Authorize.net, Stripe, or Pay by Check. Integrate with third party services such as Box, Dropbox, Google Drive, Google Sheets, MailChimp, Microsoft OneDrive, Salesforce and Zapier and use them to improve your workflow.